Geek Grotto - Get Your Geek On! 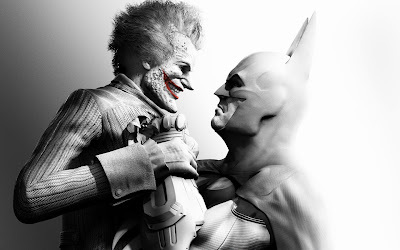 : Own The PC Version Of Batman Arkham Asylum Or City? Then Read On! UPDATED! Own The PC Version Of Batman Arkham Asylum Or City? Then Read On! UPDATED! If you own the Steam version of the NON-GOTY editions, you may want to go take a peak at Steam. You'll now notice that you also own the GOTY edition! IF you own the retail discs, then soon you should be able to enter your keys to redeem a Steam version. What's going on here? Well, since Microsoft killed "Games For Windows Live", you no longer can purchase DLC for your games. Soon, you will not be able to register your game either if you decide to reinstall. Not sure if this was WB Games or Steam's idea, but it will allow you to keep playing and downloading your game. FYI: Non Steam keys do not seem to be working yet. UPDATE: My retail keys worked as of a few days ago! Dear Batman Arkham Fans - Microsoft has begun the process of closing down Windows Live services over the next year. To make sure there is no interrupted service, we will be moving the game to Steam for verification and update services for both the Base and GOTY versions of Batman Arkham Asylum and Batman Arkham City. If you purchased either of the games on Steam all you have to do is let Steam download the latest patch and you will be fine. If you purchased the games somewhere else you will need to enter the code in Steam. (You can find steps to do this on the bottom of this. Unfortunately, you will not be able to continue playing from your current save. You will need to start a new game. Going forward you do not have to worry about where you stored that disc. If you switch computers or go to a friend’s house you simply need to download Steam, log into your account, then go to the library and select to install your game. 2. Select Activate a Product on Steam..
5. Enter your CD Key and select next once the game finishes downloading you will be able to play the game.